A&D Gallery is mounting a short exhibition of Artist designed posters. These include: Andy Warhol for Levis, Takashi Murakami for Kanye West and Shepard Fairey for Led Zeppelin. The exhibition will also include all 12 of the artists' posters for the London 2012 Olympic and Paralympic Games. Helen Clarkson of A&D Gallery said 'We are delighted to offer these beautifully produced posters by some of our leading artists at a very affordable £6.99.' 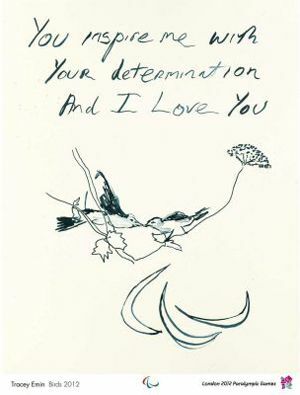 These artists include: Tracey Emin, Bob & Roberta Smith, Fiona Banner, Chris Ofili, Martin Creed, Rachel Whiteread, Bridget Riley, Michael Craig Martin, Gary Hume, Howard Hodgkin, Sarah Morris and Anthea Hamilton. If £6.99 is out of your budget you can win the complete set of 12 Olympic & Paralympic posters by visiting the A&D Gallery Facebook page at http://www.facebook.com/AandDGallery.